Along with the Flare S5 Power, three more members of the Flare S5 family were unveiled, one of which is touted as most premium among all, the Cherry Mobile Flare S5 Plus. On paper, the Cherry Mobile Flare S5 Plus has lots of similarities with its S5 Power sibling in terms of technical specifications. Both devices has 5.5-inch FHD display and powered by 1.3GHz octa core MediaTek MT6753 processor coupled with 3GB of RAM. If the latter has an advantage of having a huge battery capability, the former has its own aces - a bigger on board storage at 32GB, better front and back cameras at 16MP and 8MP respectively, and USB Type-C port. The other specs are pretty much standard - fingerprint sensor, dual SIM with LTE connectivity, WiFi, Bluetooth and the usual sets of sensors. 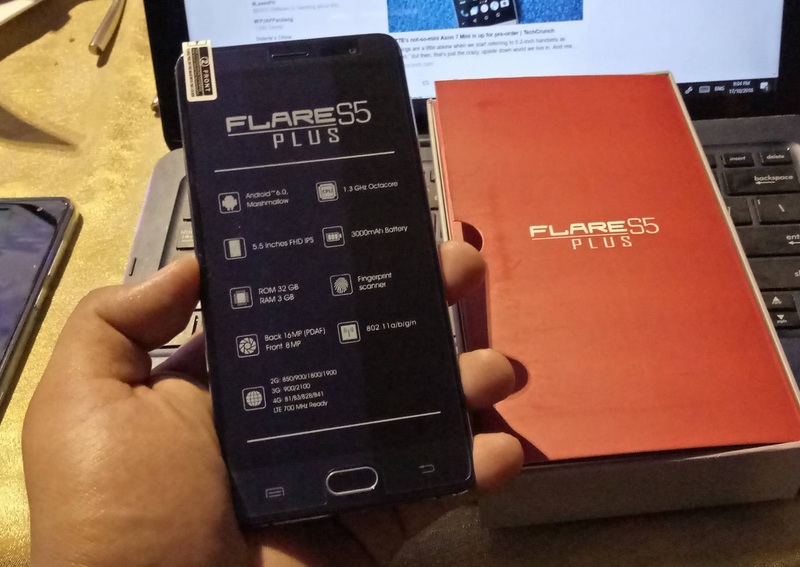 Like the other Flare devices at the #FLAREUPTION event, Cherry Mobile did not give specifics about its release date, except for the assurance that it will come out before the year ends, and if you are eyeing for this one, set aside Php8,999 from your bonus or savings.